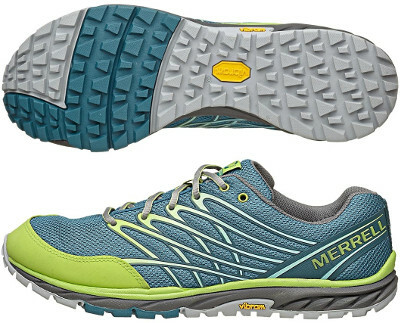 Merrell Bare Access Trail are neutral trail running shoes. The Merrell Bare Access Trail follows the idea implemented by the Ascend Glove combining typical Merrell's fit and zero offset with some cushioning featuring great response. Those looking for more impact support can have a look at the thicker Bare Access Ultra. Initial thought about the Bare Access Trail is that it is just a light alteration from the road version Bare Access 4 but it takes just upper's design and 8 mm MBound™ midsole cushioning to build an almost brand new shoe. Upper uses a breathable synthetic mesh similar to the one present in the Trail Glove 3 to make it last longer. There is also a waterproof version with Gore-Tex™ (where available) and toe box has been reinforced to protect toes against rocks and uneven grounds. Vibram™ outsole presents an agressive design with deep lugs effectively distributed to improve traction and grip on rugged terrain. There is no rock plate in place, so please take it into account when running out there.